Augusta Place at Laurel Creek in Rock Hill, South Carolina is 55+ community within the master-planned Laurel Creek neighborhood. Residents will enjoy the maintenance-free lifestyle and community amenities. Homeowners will find luxurious high-quality patio homes combined with resort-like features within an upscale community. Residents of Augusta Place can appreciate the scenic walking and biking trails that intertwine within the entire community. They can get some fresh air and take leisurely strolls alone or with neighbors and view the scenic beauty of Laurel Creek. The Magnolia Room is Laurel Creek s multi-purpose facility that is available for all residents to use and reserve for special events or parties. It features a 4,540 square-foot ballroom that is equipped with state-of-the-art light and sound systems as well as a spacious bar to suit your entertainment needs. The community also boasts The Swim and Racquet Center that is open to all residents of Laurel Creek, which they are sure to love. The pool area features a Junior Olympic-size 25-meter lap pool, a children s play pool, 109-foot figure-eight water slide, and a kids wading pool. Homebuyers can also stay active by playing at one of the three hard-surface or clay tennis courts at Laurel Creek. Augusta Place at Laurel Creek will have a total of 52 homes upon completion. A variety of custom home builders under the Warren Norman Company built the first few homes in 2006 until Epcon Communities came in 2012 to build out the rest of the lots. These luxury patio homes feature brick exteriors, alley-loaded garages, private courtyards, spacious master suites, gourmet kitchens, and flexible floor plans. These single-family homes have two to four bedrooms, two to three-and-a-half bathrooms, two or two-and-a-half-car garages and some models feature a den. These homes range in size from 1,516 square feet to 3,273 square feet. The models built by Epcon Communities are single-level with basements, while some of the other homes built by the Warren Norman Company may have second floor options. One of the many benefits of living in Augusta Place at Laurel Creek is the service provided by the homeowners association (HOA). The association fee includes yard work and exterior maintenance, irrigation service, common area lighting, and leaf removal. Homeowners can truly enjoy their free time doing fun things at Augusta Place at Laurel Creek instead of spending their time mowing the lawn. Residents can relax in their private courtyard, swim a few laps at the pool center, or socialize with friends from the community. 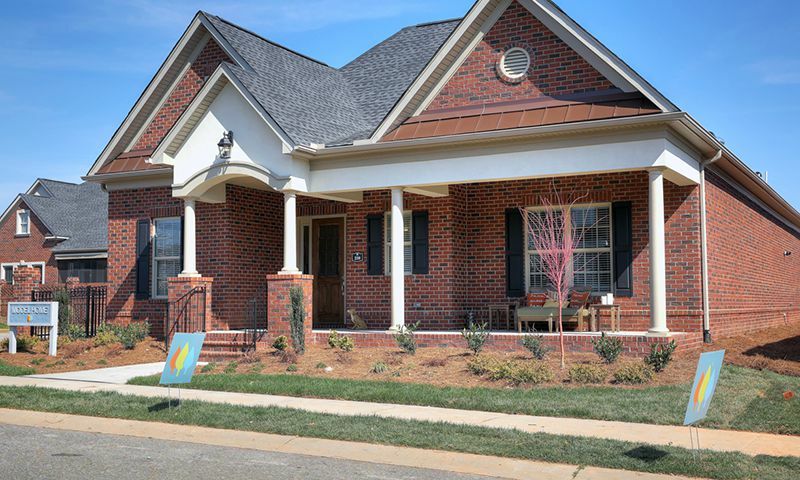 Augusta Place at Laurel Creek is located in the beautiful town of Rock Hill, South Carolina. This great location boasts a variety of nearby attractions, such as Galleria Mall, Piedmont Medical Center, and Cherry Park. Augusta Place at Laurel Creek is only a few minutes from I-77, 25 minutes from downtown Charlotte and a 30-minute drive from Charlotte-Douglas International Airport. Homebuyers at Augusta Place at Laurel Creek can enjoy the comfort and convenience of resort-like amenities set within a charming community in York County, SC. Available to all residents of Laurel Creek master-planned community, The Magnolia Room can be rented for special events and parties. Ballroom - 4,540 Sq. Ft. The Swim & Racquet Club is open to all residents within Laurel Creek. Here residents can enjoy the swimming pools and tennis courts. Check back soon for more information on the lifestyle in Augusta Place at Laurel Creek. The Courtyard Series by Epcon are luxury single-family homes that range from 1,516 square feet to 1,994 square feet and are available as new and resale basis. These homes have two bedrooms, two bathrooms, and an attached two-and-a-half-car garage. These homes have basements and courtyard space for entertaining guests and some models feature a den. The Warren Norman Company had multiple custom builders including Benchmark Builders, O'Connely Signature Homes, CWD Construction Inc, and Gladden-Bucy Builders design these single-family homes. They feature spacious floor plans with two to four bedrooms, two to three-and-a-half bathrooms, and two-car garages. These homes are available on a resale only basis. 55places.com is not affiliated with the developer(s) or homeowners association of Augusta Place at Laurel Creek. The information you submit is distributed to a 55places.com Partner Agent, who is a licensed real estate agent. The information regarding Augusta Place at Laurel Creek has not been verified or approved by the developer or homeowners association. Please verify all information prior to purchasing. 55places.com is not responsible for any errors regarding the information displayed on this website.